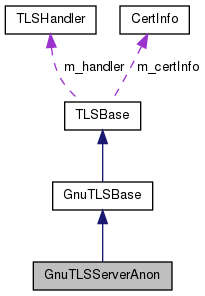 This class implements (stream) encryption using GnuTLS server-side. Definition at line 44 of file tlsgnutlsserveranon.h. Definition at line 24 of file tlsgnutlsserveranon.cpp. Definition at line 30 of file tlsgnutlsserveranon.cpp. Definition at line 36 of file tlsgnutlsserveranon.cpp.